The view from 26m above Bristol's harbourside is mercifully distracting. To the north, candy-coloured terraces and timber-clad apartments gleam in the spring sunshine. To the west, sailing dinghies ruffle the waters of the Floating Harbour. And below me are my feet, a rope and a lot of air. This is no ordinary viewpoint, and it's guaranteed crowd-free. I am gripping the main yard of the SS Great Britain, a massive spar jutting out from the mainmast of Isambard Kingdom Brunel's iron leviathan. I'm standing, tight-rope walker style, on a wobbly cable lashed to the underside of the yard, which leads back to a crow's nest on the mast. Until recently, the only people to have enjoyed this view – and I doubt they lingered over it – were the Victorian sailors who scrambled up the rigging daily to hoist, reef and trim the Great Britain's sails on its many voyages between England and Australia. Now, with the addition of a harness and a safety briefing, anyone with a head for heights can step into their shoes for half an hour. 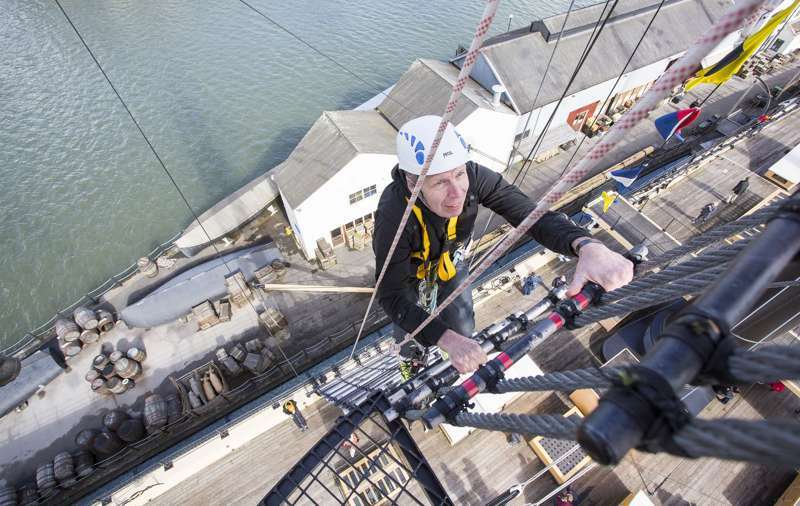 Opened to the public on 5 April, the Go Aloft Experience on the SS Great Britain is the latest attraction at the Gulbenkian award-winning museum ship, which lies in the very same Bristol dry dock she was built in during the 1840s. Designed by Brunel – who had recently engineered the Great Western Railway – the Great Britain was the world's first iron-hulled, screw-propelled, ocean-going steamship, and at 322ft the largest vessel afloat when she launched in 1843. Between 1853 and 1882, she made dozens of trips on the gold rush route to Melbourne: half a million Australians and New Zealanders are reckoned to have had ancestors on board the ship. For the 130 sailors who worked the passage, some as young as 10 or 11, conditions were tough. During the two-month voyage south, they worked ceaseless four-hour shifts, scrubbing the deck, maintaining the sails, whipping ropes and then retiring to a hammock in the cramped fo’c’sle for rest. Meals consisted of salt meat and hard tack, with a little lime juice to ward off scurvy and a gill of watered-down rum daily. Going aloft was as perilous as it sounds, with the ship's log recording a number of incidents of sailors falling from the yards, either dead on impact with the sea, or rapidly lost to its swirling currents. The ship’s best-known captain, John Gray, was forced to abandon his own cousin to this fate when he slipped from the rigging in the 1830s. But the yard was also a focus for a curious celebration which took place one month into the ship's voyage. The first instalment of sailors' wages would go on fees for quayside lodging and rum, so for the first month on board they were virtually working for nothing – or, in an early use of the phrase, 'flogging a dead horse'. After a month, sailors marked the beginning of profit by rigging up an effigy of a horse from sailcloth and a broom handle. The youngest member of the crew was sent aloft to hurl the horse into the briny deep, accompanied by a shanty sung to the captain: "I say, old man, your horse is dead…". Flinging a makeshift horse into Bristol's harbour may not be an option for today's rigging-climbers, but for an authentic glimpse of the Victorian sailor’s life, it's as close as I wanted to get. And given the short climb, a secure harness, and an uplifting view, I suspect the SS Great Britain will have soon have people queuing for this aerial traverse into our maritime past. Go Aloft tickets on the SS Great Britain cost £10 (plus ship entry).